Split system air conditioners are ideal for cooling or heating a specific area of a home. We offer installation and support for a wide variety of Daikin split system air conditioners, including wall or floor standing models. A split system can be cooling only, reverse cycle or even humidifying for use all year round. Buyers can also choose from inverter and non-inverter air conditioning systems. The Daikin inverter split air conditioning system is very energy efficient and quieter than many other brands. It uses small and frequent fluctuations rather than long periods of air bursts to combine near silent operation while optimising power output. By gradually increasing and decreasing power output regularly to maintain desired room temperature, it avoids the loud and wasteful ‘stop/start’ method used by conventional split systems. Split air conditioning systems have both an indoor and outdoor unit. The units are connected to each other through insulated copper piping and electrical cables through the wall so room aesthetics are not spoiled. The Daikin split air conditioning system is available in various designs including the wall hung model, which is very popular, and a ‘free standing’ version attached to the wall. The range of energy sizes from 2kW to 10kW means that there is a perfectly unobtrusive option for any room size. The wall mounted option employs multi-directional louvers for complete control over airflow direction. The ‘free standing’ alternative uses wide angle louvers to achieve the same result, with the added option of having both upper and lower vents – which allow warm air to rise from floor level for optimal winter heating – for greater control. All Daikin split air conditioning systems can be tuned down by 2-3 decibels so that its sound, as well as appearance, isn’t overbearing in a room. Choosing the right power range for your Daikin air conditioning system will depend on not only the room size. Room orientation, number of windows and frequency of use will also dictate which power level is best. The presence of heat generating equipment in a room will also be a contributing factor. There are a number of filters that are integrated into the Daikin split air conditioning system. They ensure that room air is not only perfectly conditioned but also clean and fresh. For those looking for a combination system, the new Ururu Sarara system includes humidifying functionality on top of the standard air conditioning functions of Daikin air conditioners. Aesthetic integration with your room is as important to us as optimum functionality. We will work with you to find the best location for your unit to achieve these goals. Equally, the outdoor unit will be placed in a discrete yet functional outdoor location. The ideal situation is for both units to be directly backing onto each other, but this is not essential. Our technicians can work around any room shapes, sizes and fixtures or fittings to place your units in energy efficient yet aesthetically pleasing locations. As leaders in energy efficient air conditioning systems, Daikin also places utmost importance in customers’ health. 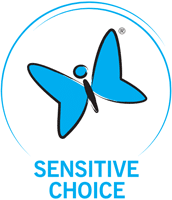 Daikin split air conditioning systems are the only range that have been awarded the Sensitive Choice butterfly symbol. This demonstrates their dedication to the Sensitive Choice program in highlighting products that address the needs of sufferers of asthma and allergies.